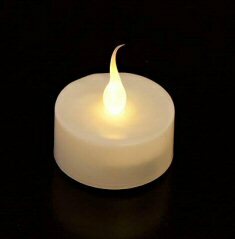 Perfect for any home or office looking for the ambiance of a flame candle, with the safety of a Smart Candle. 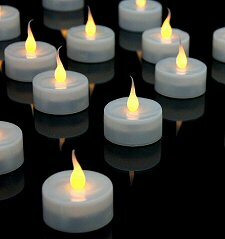 Our Wax Battery Operated Candles by Smart Candle are as close to a real flame candle as you can get. Each is molded from real wax to give you the most authentic look available. Perfect for any home or office looking for the ambiance of a flame candle, with the safety of a Smart Candle. These aren't the only electric candles, but they are the best - behaving incredibly like a real candle. One of the biggest advantages of these lights is the quality of the flicker. Generally, flickering LED candles have a randomised flickering programme "cycle", that repeats itself. Lengthen this cycle (which requires more memory in the electronics), and the candle can be made to be more realistic. Our wax candles contain extra memory to bring you a full 20 second cycle or real captured candle flicker, making these candles probably more realsitic than any other you will find. These are the best LED tealights available, and are built for everyday, casual use, at a very affordable price. These little candles are great fun! Scatter them on the window sill or on a shelf without fear of soot or other marking. Batteries are already fitted. All you do is press down on the candle body to switch on and marvel.